Out of this collection of stellar designs, I received the one called "Element" to test and review. Having tried other styles from this brand, I can say with confidence that they listen to the customer and have been incorporating improvements in each new version. The other big improvement is the Size Chart. It's so important to have size guidance you can trust, and this chart worked perfectly for me, although if in doubt, I would order larger. If you choose a design from a different page, read the reviews because the various styles fit differently, and you may need a different size. Based on my bra size and my dislike of restrictions over my ribcage, I asked for a size Large, which is spot-on comfortable for me. It's perfect for my workout routines (elliptical cross-trainer, Nordic Track ski machine, yoga, a little work with free weights), but also to wear longer term in hot weather when a cool, edgy top like this looks great over leggings and jeans, with maybe a see-through shirt or loose vest. These tops are just too pretty to restrict them to the gym! The fabric is a joy to wear, it's great at evacuating body heat and never gets sweaty (it's a mix of 87% Polyester and 13% Nylon/Polyamide, while the lining is a very silky Polyester). Very smooth and comfortable on bare skin. The two adjustable padded cups stay in place better than most and give a natural shape, instead of flattening your chest. They are removable, and there is a long, narrow pocket sewn in the front lining, where you could slip an MP3/4, a token, key or similar small object. The cut is a classic racer-back, allowing total freedom of movement for arms and shoulders. Manufacture and finishing are top quality. 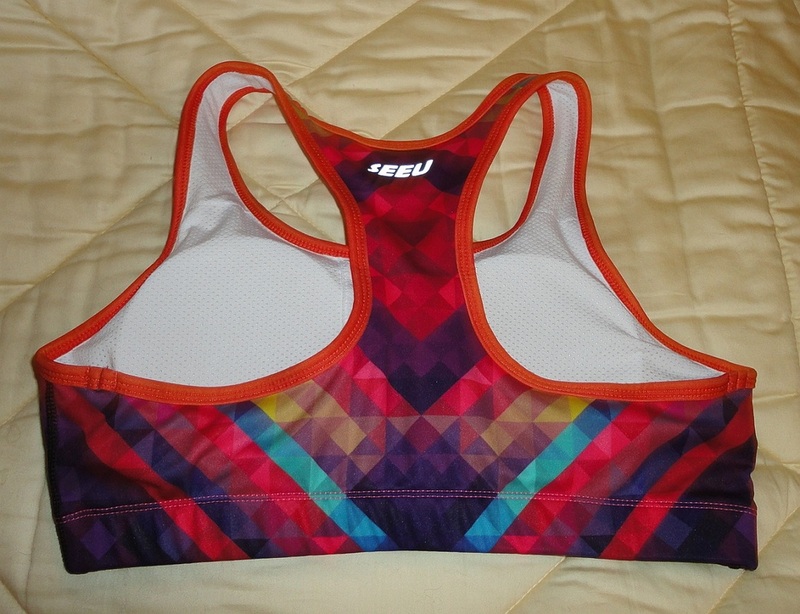 These are my favourite workout tops and I have not seen such beautiful, colourful designs anywhere else. Read my review on Amazon. Another winner from Jimmy Design. Their sport tops are unique in the choice of colours and designs and in the crispness of the printing process. I received a sample to allow me to prepare a review, and I believe this top is identical to the retail version. 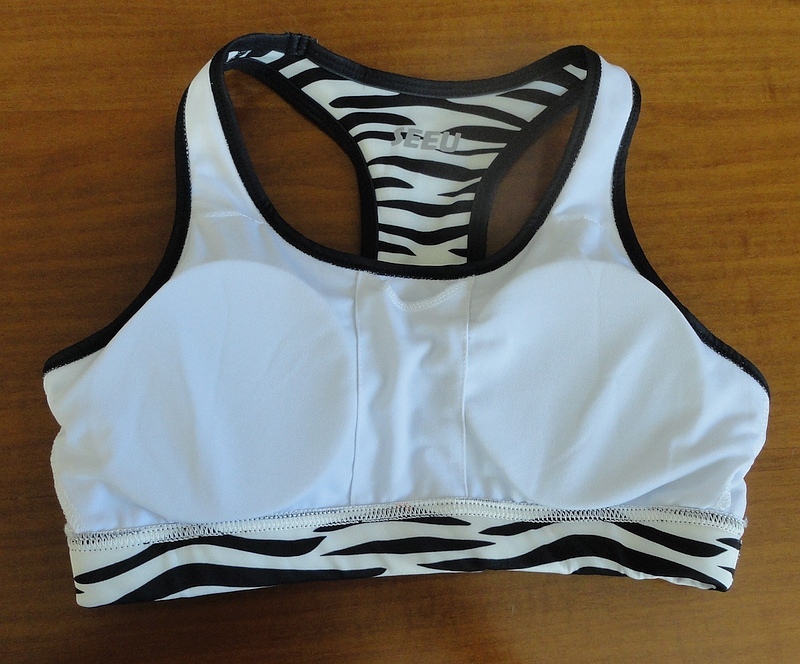 Having reviewed other sport bras by this brand, I noticed immediately that this style provides much more compression and has slightly thicker, more protective padding, which makes it suitable for a different range of sports, perhaps involving body contact and certainly where bounce control is desired, such as jogging, running, tennis and horse riding. I asked for a 34C to fit my under-bra measurement of 30 inches, which translated in a Medium size judging by the bag (there is no size tag on the bra itself). The previous model's Medium fit me perfectly, but this new one is very, very different. The fabric is less stretchy, the elastic band is definitely tighter and the straps seem a little shorter. If I were doing it again, I would ask for a Large or even XL. So, if you have already bought a previous model, I suggest you go up a size or two, especially if your cup size is C or larger. The same guidance applies to a new purchase. Find your usual bra size and order a size or two larger. Since we are dealing with serious compression, this top will be great for the time you need it, but less comfortable for extended periods. But I do stress that the compression factor is significant, and you WILL want to wear this for more than just the gym. The style I chose is called Zebra, for obvious reasons. It looks exactly as in the photo, perhaps even better. The pattern of crisp black and white irregular stripes is unaffected by the stretch. Really very sharp and fun to wear. This is a quality item, with a seriously sporty cut, tight, precise stitching and two protective foam cups floating loose inside the two layers of the bra, so you can place them exactly where you like. They are removable but I can't imagine a reason to take them out. The wide front straps and the racerback shape allow full freedom of movement for arms and shoulders. There is a hidden pocket sewn in the middle, at the front (see photo). It's shaped and sized to hold an MP4 or even a small portable but, realistically, it is more suited to hold a locker key, or car keys, safely and discreetly. The outer fabric for this style is the same mix of 87% Polyester and 13% Nylon/Polyamide as in the previous model but it feels a bit tighter; the lining is again a very smooth 100% Polyester. Cool and silky on the skin, this combination lets perspiration escape and deals well with temperature changes. The resealable plastic bag the bra comes in is useful for long-term storage to avoid snags in a drawer. These sport tops give me the impression of being durable and easy to maintain with the usual care (machine washing or hand washing in cool water, hang to dry). At the current price of £16-17, it's easy to get carried away and buy a few different ones. Super-cute and very unique, and just as pretty in person as in the photos. I received a sample bra from the manufacturer without any pressure to write a review, however, having tried their older model, I feel qualified to make a comparison and point out that these new styles fit quite a bit tighter. That is not a negative, just my warning with regard to size. I really love the choice of colours and patterns, and the crispness of the printing process. 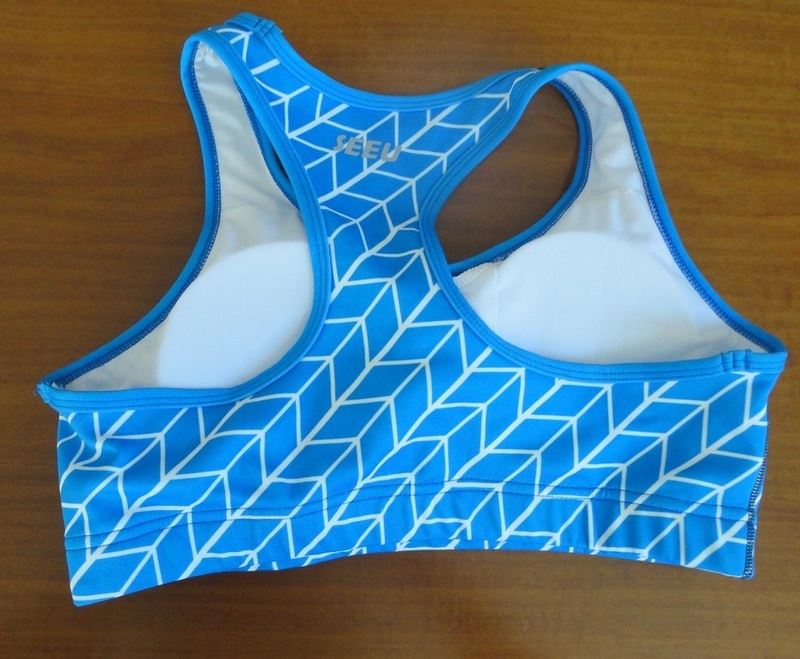 Compared to the previous model, I noticed immediately that this style provides much more compression and has slightly thicker, more protective padding, which makes it suitable for a different range of sports, perhaps involving body contact and certainly where bounce control is desired, such as jogging, running, tennis and horse riding. Following the advice to order a size bigger than your normal bra size, I had asked for a 36B (my under-bra measurement is 30 inches). I received a Large and I think XL would have been even better comfort-wise. The feel is very, very different from the previous model. The fabric is less stretchy, the elastic band is definitely tighter and the straps seem a little shorter. So, if you have already bought one of the early styles, I suggest you go up a size or even two, especially if your cup size is C or larger. Since we are dealing with serious compression, this top will be great during your workout, but less comfortable over the long term, unlike the earlier models which I could wear all day without even noticing. If compression and bounce reduction are important to you, you will be very pleased with this sport top. Speaking of pattern, I chose Word and I find it even prettier in real life than in the photos. The white is very fresh, and the printing crisp and attractive with a strong graphic appeal. This top exudes quality and, despite the highly decorative nature of the fabrics, the cut is intended for sporting performance, with tight, precise stitching. There are two protective foam cups loose between the two layers of the bra, so you can place them exactly where you like. They are removable but I can't imagine a reason to take them out. The wide front straps and the racerback shape allow full freedom of movement for arms and shoulders. 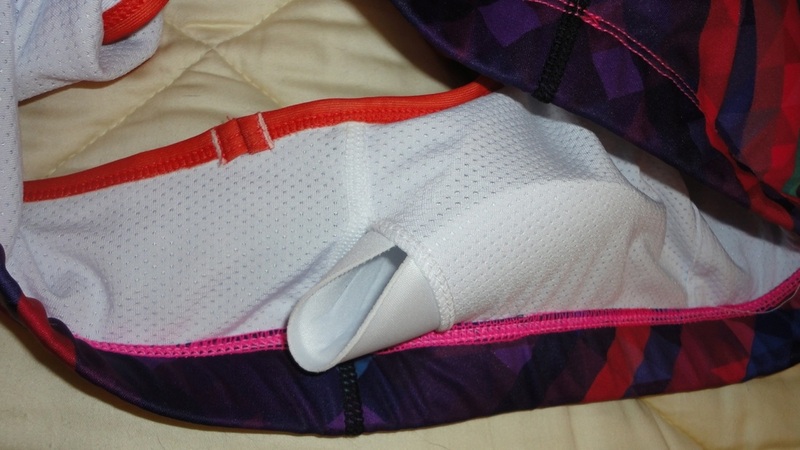 There is a hidden pocket sewn in the middle, at the front (see photo). It's shaped and sized to hold an MP4 or even a small portable but, realistically, it is more suited to hold a locker key, or car keys, safely and discreetly. The outer fabric for this style is the same mix of 87% Polyester and 13% Nylon/Polyamide as in the previous model but it feels less stretchy; the lining is again a silky 100% Polyester. Cool and smooth on the skin, this combination fabric lets perspiration escape and deals well with temperature changes. Every bra comes in a resealable plastic bag which can be used to keep it snag-free in a drawer. These sport tops give me the impression of being durable and easy to maintain with the usual care (machine washing or hand washing in cool water, hang to dry). At the current price of £16-17, it's easy to get carried away and buy a few different ones. The prettiest sport top with serious compression and a comfortable design. I really like these sport tops from Jimmy Design. They are unique in the choice of colours and patterns and in the crispness of the printing process. I received a sample directly from the manufacturer to allow me to prepare this review. 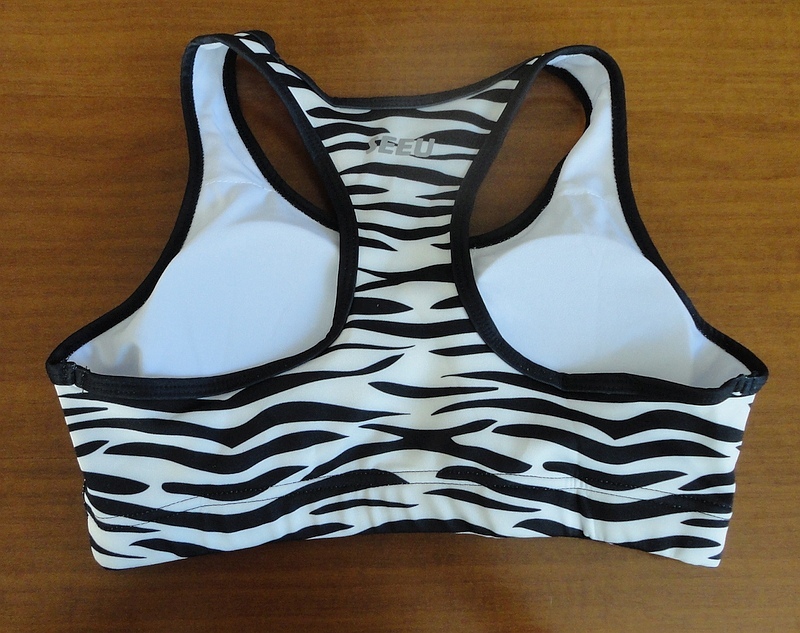 Having tried other sport bras by this brand, I noticed immediately that this style provides much more compression and has slightly thicker, more protective padding, which makes it suitable for a different range of sports, perhaps involving body contact and certainly where bounce control is desired, such as jogging, running, tennis and horse riding. Following the advice to order a size bigger than your normal bra size, I had asked for a 36B (my under-bra measurement is 30 inches). I received a Large and I think XL might have been better. The feel is very, very different from the previous model. The fabric is less stretchy, the elastic band is definitely tighter and the straps seem a little shorter. So, if you have already bought an older style, I suggest you go up a size or even two, especially if your cup size is C or larger. Since we are dealing with serious compression, this top will be great for the time you need it, but less comfortable for extended periods. But I do stress that the compression factor is significant, and you WILL want to wear this for more than just the gym. My choice was Wall, a beautiful, cheerful royal blue with an oblique, geometric pattern in white, reminiscent of brickwork. It looks better in person than in the photo, crisper and brighter. These sport tops give me the impression of being durable and easy to maintain with the usual care (machine washing or hand washing in cool water, hang to dry). At the current price of £16-17, it's easy to get carried away and buy a few different ones. Super-cute and very unique, I always receive positive comments whenever I wear it at the gym. I was sent a sample without any pressure to write a review, but I wanted to share my complete satisfaction and delight at the really gorgeous designs that make this top so unique. 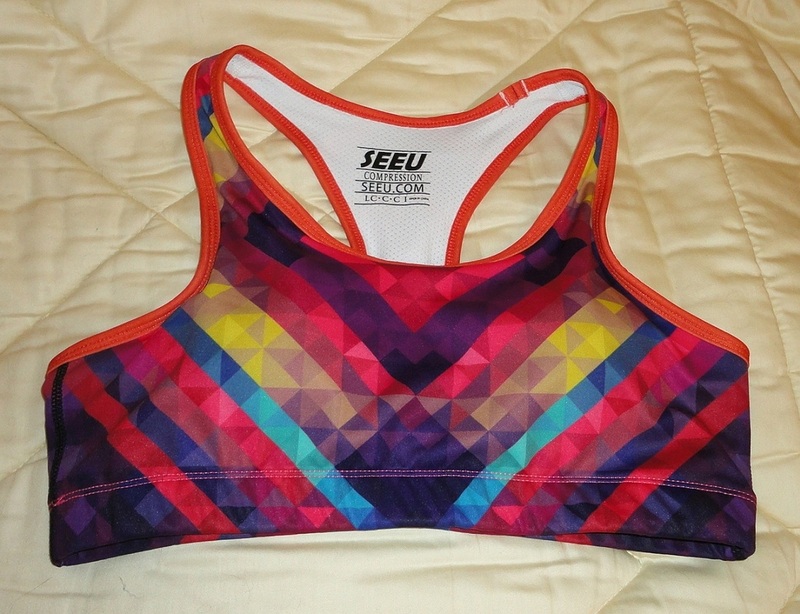 This is a really adorable fitness top which makes me feel feminine and stylish while I work out. When I was asked to select one to review, the choice was difficult … I wanted most of them! The colourful and inventive patterns change all the time, so if you see one you like, grab it quick! This sports top is beautifully cut and finished with a high, ribbed section holding it comfortably in place under the chest. The front straps are wide enough and the racer-back shape at the back allows total freedom of movement for arms and shoulders. The outer fabric for this model is a mix of 87% Polyester and 13% Nylon/Polyamide, while the lining is a very silky Polyester. 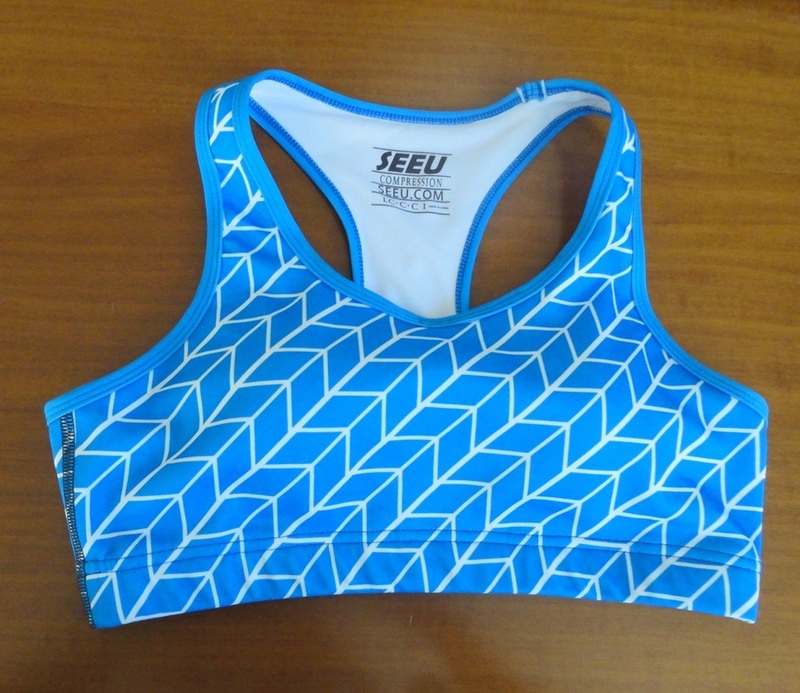 Excellent multi-directional stretch and very effective at dealing with perspiration and temperature changes. It feels really good on the skin. Little details, such as the resealable plastic bag it comes in, confirm the overall quality of this product. For padding there are two adjustable and removable foam cups of medium thickness and with a clearly protective purpose but, unlike so many sports bras, this one does not squash and flatten your breasts. 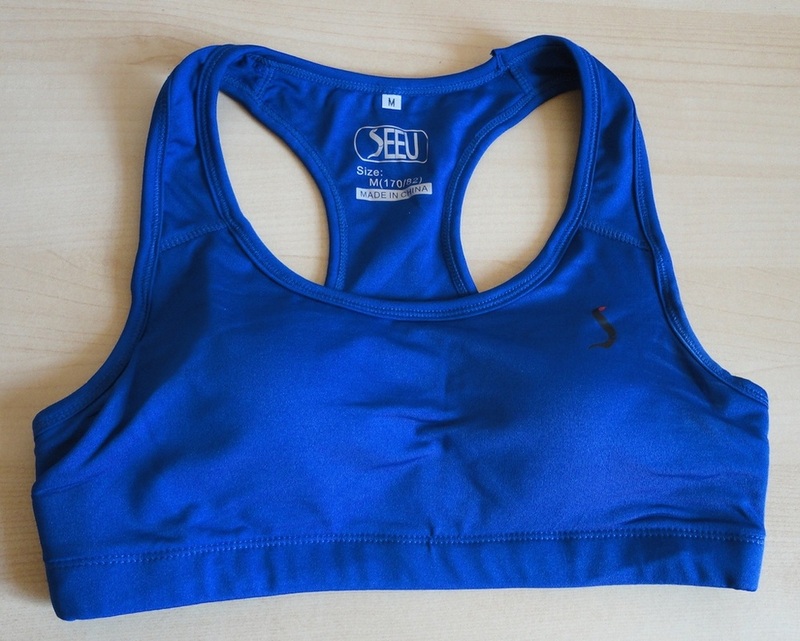 In fact, it produces a natural-looking, supported and pretty shape that looks good under T-shirts and tight tops. I have a dress with a similar racer-back cut under which I like to wear this bra because it remains completely invisible, but flatters my figure without squeezing my ribcage. Speaking of sizes, I got a Medium (my under-chest measurement is 30 inches) which fits me very comfortably. If I wanted to minimize bounce, I could even go down to a Small. To fully test this top, I have worn it all day long, before, during and after exercising and truly forgot I had it on. Normally I have very low tolerance for restrictive garments but found this bra really unobtrusive. I did give me a good sense of protection and I felt very safe using weights and moving around exercise machines, where it is easy to bump into things. 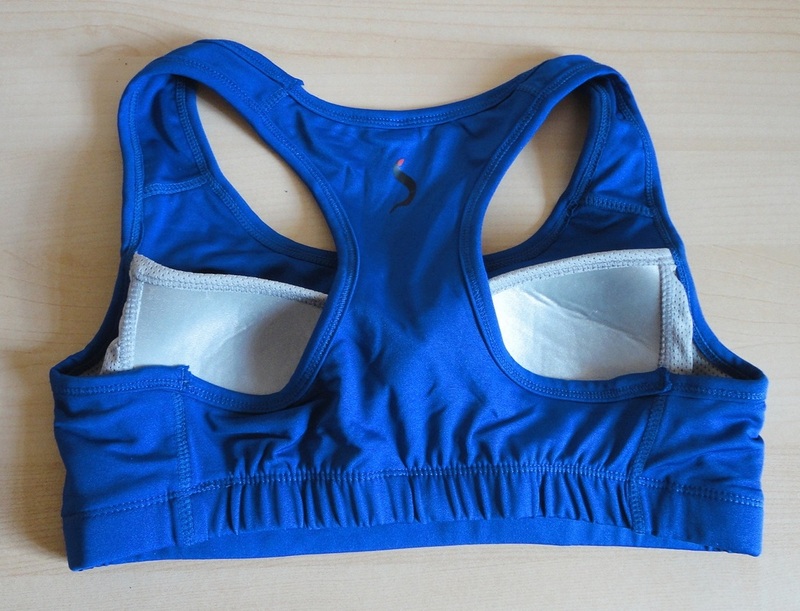 This bra would be perfect for yoga, floor exercises, pilates, weights, that sort of thing. This garment exudes quality and should last well with minimal care (it goes in the washing machine at a cool setting, although I prefer to hand wash it). At this price level, it represents great value for money and actually looks better in person than in the photos. A very comfortable sports bra which looks good and is perfectly acceptable as a visible top, so if you get hot, you can whip off your T-shirt and still look decent, or just wear the top matched to leggings or shorts. The inner construction is quite interesting, as at the front, it consists of a separate, built-in bra with light padding (I tried to show this detail in my photos). The shape of the bra is such that it enhances cleavage rather than flattening everything. The support comes from a little compression but in the correct size, this is entirely comfortable. Regarding sizing and fit, I received a size Medium, which is perfect for me, but I get a feeling that if your cup size is C or bigger, you would be better to get the printed style, which has removable padding instead of the integral bra. This sport bra/top is well cut and neatly finished with a wide elasticated band holding it firmly but gently in place around the ribcage. 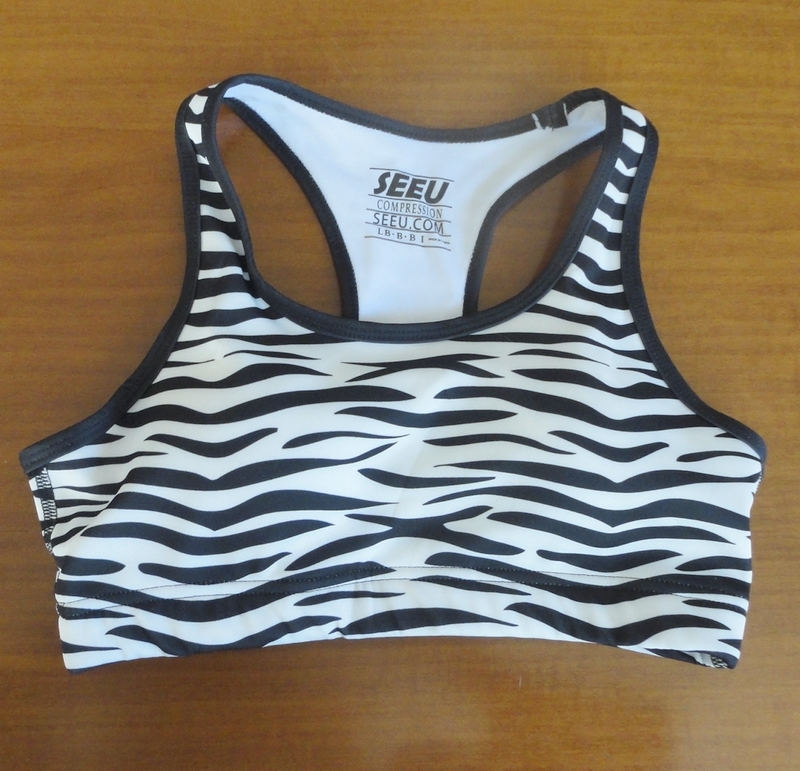 The front straps are of medium width for a sport bra while the back is fairly large with nicely rounded arm cut-outs, allowing the free movement one needs when exercising. I'm always fascinated to see so many variations in the composition of the fabrics used for this kind of garment. This particular style is made of 92% Polyester and 8% Spandex fabric, a lighter option than some others I have. It has excellent stretch in all directions and disperses heat and sweat efficiently. I wore this top for several hours before and while exercising. It passed the test in that I was hardly aware of having it on (and this from someone who has a phobia of tight garments). I was sent this bra without any pressure to write a review, however, I am delighted to have found nothing at all negative to say. With the usual care (hand-washing and drip-drying or cool machine wash), this bra stays in good condition and appears quite durable. So, comfort, good looks and a very competitive price.